Abasi interned at Coogi and ended up at NEPENTHES, the parent company of Engineered Garments and Needles. Starting as an assistant designer to Daiki Suzuki, he got up close and personal with fabrics and gained a firsthand appreciation of domestic manufacturing. Rosborough, meanwhile, cut his teeth designing denim at Ralph Lauren. With Abasi Rosborough, the two craft a menswear vision that paves a path for the future while acknowledging the past. Five contenders are vying for the top award in this year’s CFDA + Lexus Fashion Initiative. Competing for the top prize of a $100,000 grant will be Abasi Rosborough’s Abdul Abasi and Greg Rosborough; Araks’ Araks Yeramyan; Jonathan Cohen’s Jonathan Cohen and Sarah Leff; Public School’s Dao-Yi Chow and Maxwell Osborne, and Tracy Reese. Win or lose, each brand will take part in a nine-month business residency in the Lexus-underwitten program. Sustainable innovation is a key goal for this third installment, which also aims to spur thought leadership and meaningful change. The nominees, CFDA officials and Lexus executives planned to toast the competition Wednesday night at Blue Hill NYC. Rosborough’s five-and-a-half-year-old company has always had green roots. From the start, the founders have used dead stock fabric to make their men’s wear, which is manufactured entirely in New York. Limited production runs and minimal use of plastic bags and other shipping materials are a few other environmental safeguards in place. Committed to advanced tailoring, the pair strive to create performance-oriented styles that ease wearers’ range of motion. Although the pair met at the Fashion Institute of Technology, they fell into design from diverse fields. Abasi served in the U.S. military for eight years with a final assignment repairing the missile system on Apache helicopters in the Netherlands. Rosborough, a former University of Arizona basketball player, first offered unsolicited design feedback to Nike after the sneaker giant redesigned his team’s uniforms. 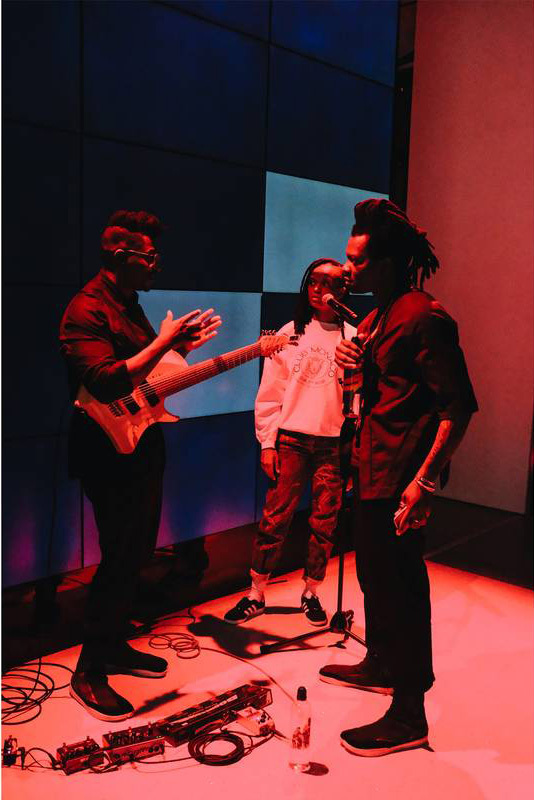 The brand has supported Abasi Rosborough shows in recent seasons. With distribution in 27 stores, Asia is the largest market for Abasi Rosborough. Expanding footwear is part of the company’s growth strategy, and accessories, especially leather goods and bags, are being considered. Having never wanted to be “a lifeless, soulless fashion brand that just has nice items. We want to speak to bigger themes that are going on around us in our own times,” Rosborough said. It’s been a big week for designers in America. First the CFDA and Vogue Fashion Fund, and now five new designers are working with the CFDA to make their businesses more sustainable. The five finalists are Araks, Public School, Tracy Reese, Abasi Rosborough, and Jonathan Cohen Studio. The five labels will embark on a nine-month program called the CFDA + Lexus Fashion Initiative. They’ll have access to experts across the field of conscious fashion to improve their supply chain, environmental friendliness, and social responsibility. Along with the brand’s SSENSE-exclusive flight jacket, Abasi Rosborough has prepared another limited release for Fall/Winter 2018. This time, the New York-based label has prepared to relaunch its signature tabi boot in new colorways. Available in black and natural hues, the shoes are indicative of the brand’s dual influences of urban functionality and Eastern comfort, with split toe construction, zippered closure and premium construction. Panels of mesh & grain leather or suede ensure both breathability and longevity, with a grippy outsole ideal for slippery winter sidewalks. Filmed and edited by Levi Walton, the visual puts the spotlight on a recent NY Times article about facial recognition, which also highlights the standout face masks by Ryan Burke, in addition to select silhouettes that were showcased in the FW18 fashion show. With a renewed interest in clean eating, natural products, and connecting with nature, society is focused on wholesomeness. Sensing that desire for a primordial lifestyle, designers Abdul Abasi and Greg Rosborough looked to the sartorial tendencies of isolated communities and lost cultures in their spring 2019 collection. "We're thinking about a pre-industrial time when things were handmade," Abasi explains citing the Hopi and Navajo tribes of Arizona as a point of reference. Natural textiles with a weatherworn look were cut and draped into shapes reminiscent of kimonos, kendo jackets, and ascetic robes. Shades of saffron and maroon evoked Tibetan monastic orders while the opening looks in black and closing ones in white, respectively touched on solemnity and purity. "Marc [Meuller] told us that the most amazing night of his life was spent in the Moroccan desert with a Bedouin tribe," Rosborough says referring to the multi-instrumentalist who played the drum and didgeridoo at the runway show. "They wore cloaks that made their bodies more mysterious." That ambiguity came through in open silhouettes cut to accommodate different heights and body types. Standing in sharp contrast to fashion's current preoccupation with flashy body-con clothes, the collection's subdued, meditative nature proves that simplicity can make a bold statement. Dubbed Desert Phantom, the collection addressed its underlying meaning via a global range of references and a series of inventive techniques, including the use of typography designed by artist Corey James that spelled out the name on parkas and flight jackets in shades of navy and crimson. 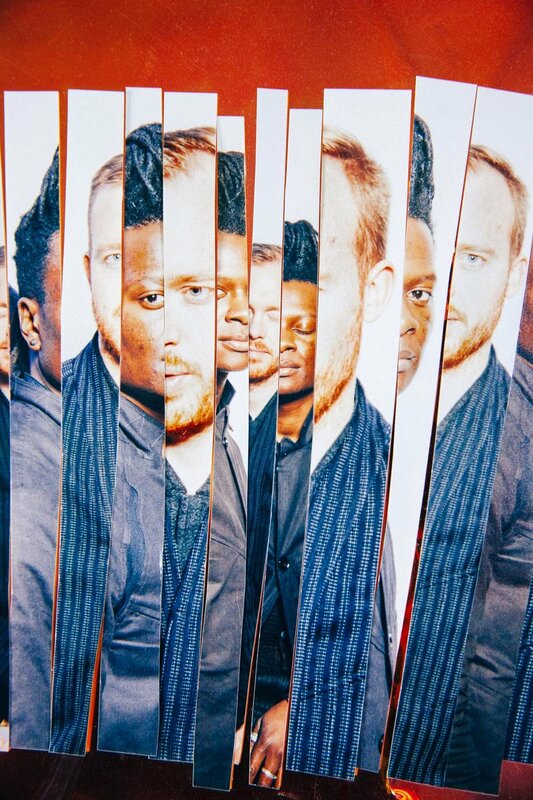 With one-man band Marc Mueller providing an otherworldly soundscape, Abasi and Rosborough set a mood that carried through the show’s 30 looks. Eclectic, with attention paid to details like texture and pattern, the clothes represented a melange of cultures. The loose-fitting silhouettes of blazers called to mind Japanese haori; rust-colored stripes and frayed black linen on dusters and anoraks channeled all manner of traditional dress. 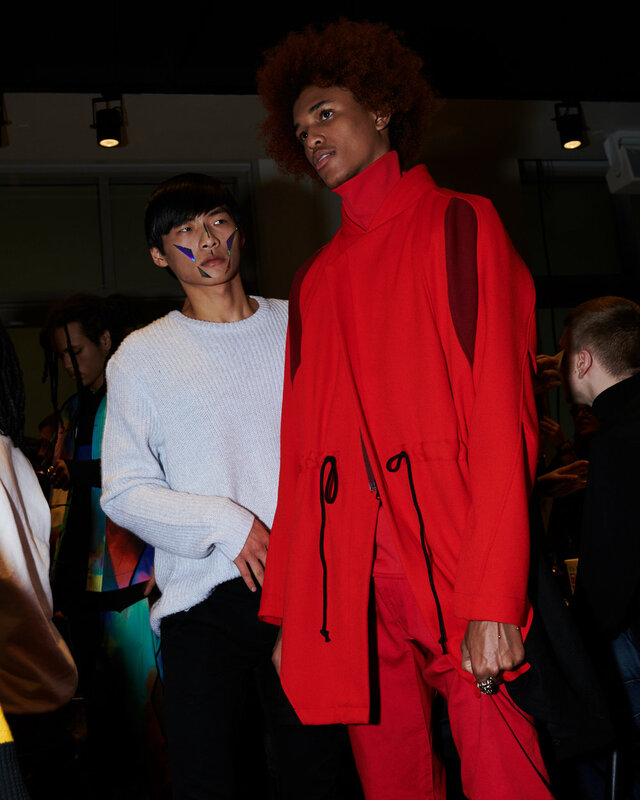 The clash of past meets present, East meets West, could have felt unfocused, but the collection was anchored by an of-the-moment sensibility, from the sleek tabis to the drawstring track pants. 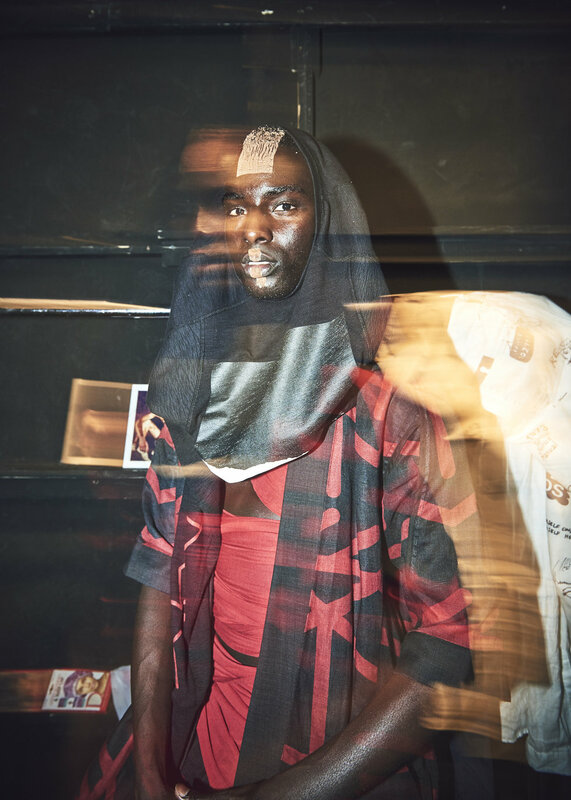 As our coverage from New York Fashion Week: Men’s continues, here we get a look at what Abdul Abasi and Greg Rosborough have conjured up for Spring 2019. At the core, the collection explores fleeting cultures and tribes. The assortment includes kimono-inspired outerwear, various items with Navajo print, fitted bottoms, wrinkled cotton silhouettes, and items constructed from frayed linen fabrics. In addition, we see a nod to the desert via a series of clean white garments. Recognizable items, like parkas and bomber jackets, are trimmed of unnecessary detailing — instead, goods are realized with sleek cuts and heritage-inspired patterns, bolstered by the quality of the reclaimed fabrics that inform Abasi Rosborough’s seasonal releases. Thumbhole-accented sweaters sport insert panels that contrast understated craft with appealing patterns, while outerwear showcases collarless necklines influenced by Japanese layering pieces and interior drawstrings for adjustable fits. Monochrome items are elevated with accents of blue, green and red, preventing the collection’s various patterns, pockets and pouches from reading as too busy. Instead, the various accessories — shoulder bags, obi-like belts, enormous scarves and a new iteration of the brand’s signature tabi boot — served to complement the techwear undertones that Abasi Rosborough develop upon each season, adding another layer of functionality to the intelligently-designed garments. 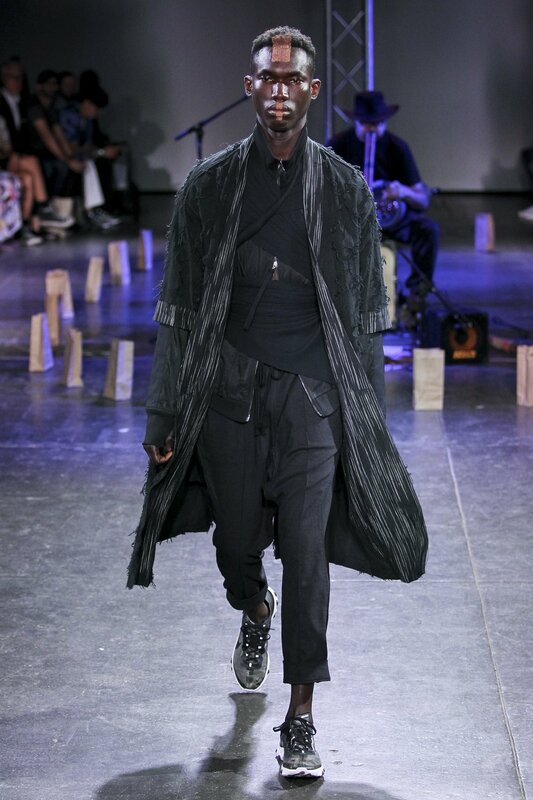 In their sophomore showing during New York Fashion Week: Men’s, Abdul Abasi and Greg Rosborough explored a desert phantom theme that referenced a variety of vanishing cultures and tribes. The design duo paraded a diverse range, from kimono-inspired jackets and coats and fitted cargo pants to Navajo-printed parkas. The color palette included deep burgundies and burnt orange that brought an Eastern sensibility to the forefront, while a flowing white section telegraphed the desert inspiration. “We even looked at ‘Lawrence of Arabia,’” Rosborough noted. A wrinkled cotton hybrid poncho with matching head scarf and an ethereal topcoat in the same fabric also drove the desert theme home. Likewise, a Tencel linen that was frayed to look old — employed for bomber jackets and coats — reinforced that worn-in traveler vibe. 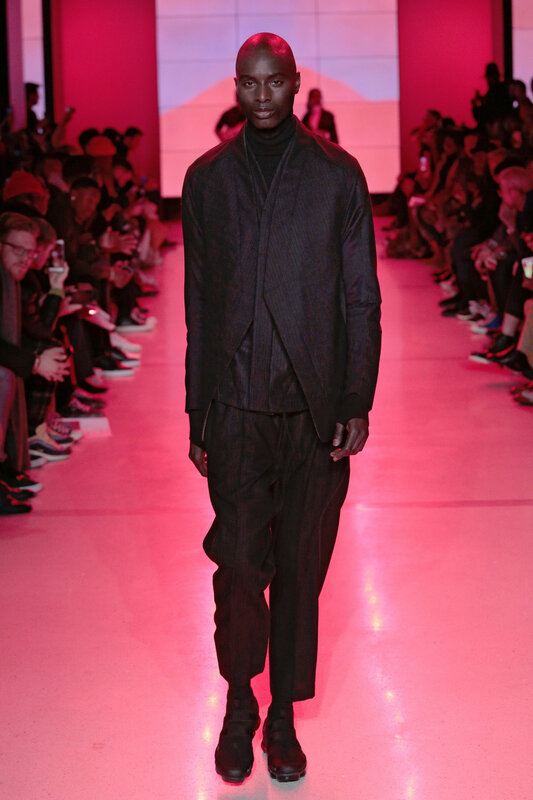 With this effort, Abasi Rosborough continues to make its mark in men’s fashion. “We’ve seen an exodus of big designers this week, but we look at it as an opportunity for new designers to step forward,” Rosborough said.